The headline pretty much says it all, though the standard disclaimer applies: Don’t try this at home. 1) How long has there been a “Slingshot Channel”? 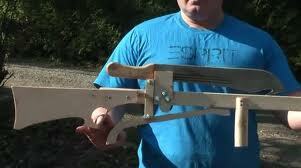 2) How soon before the Machete Slingshot makes it into a movie? 3) It was kind of a cop-out for Goldfinger to be shooting at a defenseless piece of cardboard. He should have gone after something dangerous like a watermelon. Or a kitty.